Bederman, Diane Weber. 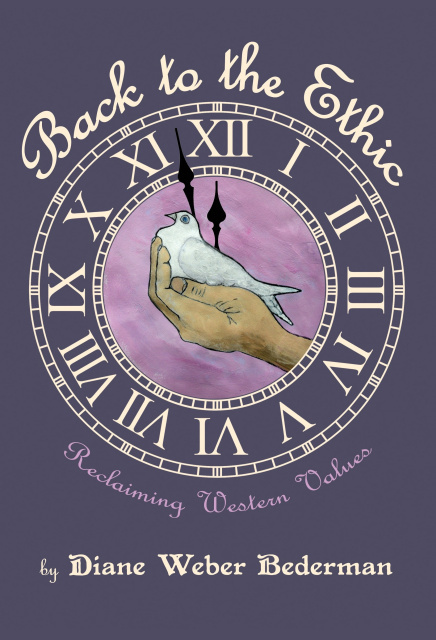 Back to the Ethic: Reclaiming Western Values. Canada, Mantua Books, 2015. The belief in an ethical God makes it possible over time, to move from a society of tribes to a society of many tribes, held together with commonly shared beliefs, stories, and traditions, because this God demands that we care for the other, the stranger, because we know how a stranger feels; we were once strangers in a strange land (see Exodus 23:9) (p. 60). Canadian author Diane Weber Bederman, a friend of BackChannels’ editor, has put together a brief compelling volume about the origins of compassion, empathy — a pervasive thoughtfulness most of all — in contemporary western thought by way of Biblical language and lore and the interaction of the Judeo-Christian vision of God and man as woven through the western experience. Ethical monotheism is not the enemy. Belief in the ethical God of the Christians and Jews counterbalances egoism and the idolization of another human being. I cannot place belief in any man perfecting himself. The evidence is overwhelmingly to the contrary. I wrote about that earlier, in my chapter “The Snake Tempted Me,” about the Enlightenment and the rise of secularism. More people have died from wars that embraced secular fundamentalist propaganda than have been killed in wars based on religious differences. Encyclopedia of Wars authors Charles Phillips and Alan Axelrod document the history of recorded warfare. From their list of 1,763 wars, only 123 are classified as involving a religious cause; these wars account for less than 7 percent of all wars and less than 2 percent of all people killed in warfare. It is estimated that more than 160 millions civilians were killed in genocides in the twentieth century alone, with nearly 100 million killed by the Communist states of USSR and China. Think of Joseph Stalin, Mao Zedong, Pol Pot, Idi Amin, Kim Jong-il, and Adolph Hitler. Bederman is right and rightly quotable, page after well researched and thoughtfully written page, for her book reminds of basic principles and tenets that form the bulwark of a healthy and productive western society. The tour begins close to the thought, “Before ethical monotheism and the revelation at Mount Sinai, there was little concept of the intrinsic value of a human being. There was little concept of the sacredness of human life” (p. 11). Given the spectacle created by dictator and “eye doctor” Bashar al-Assad in Syria with the help of Putin, Khamenei, and Baghdadi, one cannot discount Bederman’s observation of history and its present corollaries, for conscience, empathy, kindness, human rights, freedom, and love itself may not be givens in human affairs but transmitted through the oral and written traditions in language of a civilization born of suffering beneath the words, whips, and yokes of tyrants. For that, the Judeo-Christian experience has been (from Pharaoh to Hitler) immense. There is a commentary in one of the many books about the Bible that imagines God’s response to the happiness of the Israelites after the drowning of the Egyptians. God hears the angels singing and celebrating His great victory. But instead of rejoicing weeps and rebukes them. “Why are you singing?” He asks. “Why are you rejoicing? The Egyptians are My children, too, and they are dead, drowned in the sea. There is no cause for you to sing. Their deaths are not to be celebrated” (p. 38). True, and to BackChannels’ mind memory of a passage in an old Haggadah serves up the same lesson. We — of the Jews and the “mixed multitudes” that joined the flight from Pharaoh, of “the west”, of the world’s democratic open societies, of the realms of the considerate and lawful (as opposed to those more familiar with capricious justice) — don’t rejoice at death, not even the death of mortal enemies. As a philosophy of ethics, Bederman takes on abortion, utilitarianism, geneticism, too accepting a multiculturalism, and, of course, moral relativism: “If ethics have no extrinsic or intrinsic substantive base, then ethical decisions will be made by those in power who can impose their beliefs on others” (p. 75). Again, page after page, Back to the Ethic proves a rich and thoughtful reading, one also at times personal as when Bederman encounters her own passage through hell in the form of a costly medical misdiagnosis and the path she takes in response to it. However, the author does not dwell in the region of her own mortality but rather in the realm of the universal and its reflection in scripture and the defense through time of Judeo-Christian belief in the structuring of the western tradition and today’s compassionate, democratic, open, and most vibrant societies. We don’t do “bloodlines” — we do lines of belief. Catholics may wish to differ as regards the ownership of Rome. Saudi Arabia rakes in $30 billion annually from the Haj — and all, of course, are welcome to return. However, there are many Muslim-majority states worldwide, and so the issue is somewhat disingenuous as regards where a Muslim may feel at home or where a longer-lived tribesman whose cultural legacy far predates Islam and to whom conversion (even if sold as “reversion”) surviving some elements in Islam would seem to be a local issue this day. As an ethno-religious presence, the Jews have a broad community and many arguments about being Jewish come up as much as they do in Islam. My direction as regards ethnography, governance, and religion are involve just two or three themes: 1) let’s meet somewhere around monotheist humanism and agree to peace; 2) global cultural diversity may be as important to humanity as global biological diversity — let’s preserve one another by recognizing that others are “First People” and “Original People” and “Chosen People” too — the condition is not exclusive! ; and 3) if we adopt as overarching values the pursuits of compassion, humility, inclusion, and integrity, our own humanity and the “humanity of humanity” will do just fine, and it may do just as much despite ourselves. Every child born is born with ready made ethnicity, family, language, and religion. Not every child born, however, gets to enjoy them or keep them, and there are many reasons for that, but in that we lose a few of our approximately 7,000 living languages each month, the matter of cultural diversity and preservation should be taken as seriously as that of biological diversity. We do not know what or whom may hold some secrets beneficial to the world’s overall survival, experience of life, and qualities of living. There is an old world obsessed with resource competition and deficit, but here one may argue, this given that food distribution, for example, presents economic, logistical, and political issues and proves as much or more of a challenge than producing raw food supply to cover hunger in the world, that the same are “problems in the head” and partly related to emotional deficit and social self-concept. Heighten cooperation, integration, and trade across space, and one might find economic and resource development benefits concomitant. Can we change the way we do business? Our despots gather and tie up wealth primarily to expend the same in the worst ways imaginable; our NGOs and assorted nonprofit service organizations stretch dollars practically into infinity, or so they may try on behalf of the welfare of their fellow humans. Compassion because concern with the well being of another creates always a more pleasing environment between the two. Humility because while hurtling through space on our “pale blue dot”, we may not know everything, and God forbid we ever do. Inclusion because the more taken in with compassion, humility, and integrity, the stronger and more surviving the entire species that is Homo sapiens sapiens. Integrity because when the lying stops, many conflicts will also, and some will be able to do more for many than is possible in decaying societies dependent on “pandering and slandering” for their existence. I’ve edited Waseem Altaf’s piece lightly, some for style by turning “%” into the written “percent” and spelling numbers when they’re used to start a sentence, and some for online readability (“Paragraph frequently” would be my advice). The gist is simple, a familiar “tale of two states born in 1948” — one produces a mighty ultra-modern democracy, and the other suffers along with military dictatorships and a grievous record of political corruption and violence. In general, I argue the comparison only partially valid and otherwise deeply unfair. We were extremely poor yet we had books at home, said Ada Yonath, the 2009 Nobel laureate in chemistry from Israel. Six million Israelis buy twelve million books every year, being the highest consumers of books in the world. Knowledge comes through education and Israel has the highest school life expectancy in South West Asia with the highest literacy rate. In Israel, education is compulsory for children between the ages of three and eighteen. Israel also spends $110 on scientific research per year per person. Six of the best universities in the world are in Israel. For every 10,000 Israelis there are 145 engineers or scientists. On the other hand there is zero percent chance that Pakistan will achieve the millennium development goals on education by 2015. India, Bangladesh and Sri Lanka are well on their way to achieving the same goals. One in ten “out of school children” in the world is a Pakistani. What is required is an additional spending of rupees 100 billion, a fifty percent increase over current spending. Israel, the most threatened country in the world was spending 24 percent of its GDP on defense in 1984. Today it is spending only 7.3 percent. The budgetary allocations have since been diverted towards productive sectors of the economy. We on the other hand are spending around 50 percent of the net revenue receipts on defense. As a major chunk of foreign arms purchases is made through loans, there is no account of the amount of loans taken and the interest paid thereon. As much as 50 percent of the net revenue receipts go to debt servicing. As a result of “love for knowledge”, deeply ingrained in the Jewish mindset, three out of the four most influential people in the last century were Jews. Except Charles Darwin, the others namely, Karl Marx, Sigmund Freud and Albert Einstein were all Jews. Forty-five Jews have won the Nobel prize in Physics so far. Twenty-eight received the Nobel prize for original contribution in the field of chemistry. Fifty-two of the Nobel laureates in the field of physiology and medicine were Jewish by birth. Twelve recipients of the Nobel prize in literature and 21 in economics were also Jews. Nine got the same prize for peace. In other words, 0.3 percent of world population received 24 percent of the Nobel prizes. A Jewish mother would like her son to be a scientist than to be the Head of a State. Albert Einstein was offered the Presidency of Israel which he politely refused. So it all originates in the family values. The love for knowledge is learned as it is valued in the family. Anything rewarded in the form of praise or other incentives within the family and for that matter in the larger social setting is reinforcing and ultimately becomes part of the national character. A state and society which honors the knowledgeable becomes a formidable force to reckon with, as technology is based on scientific knowledge and whoever has the technology has the power. The six day war which Israel fought against the combined armies of Egypt, Syria, Jordan and Iraq resulted in the total capitulation of the Arab Armies. Israel captured the Gaza strip and Sinai Peninsula from Egypt, the Golan Heights from Syria and the West bank and East Jerusalem from Jordan. Some 779 Jews were killed against 21,000 Muslims. While 24 percent of Nobel prizes went to the Jews 22 percent of humanity is Muslim. What has been their contribution in the last 800 years in the fields of Physics, Chemistry, Medicine, Literature and Economics? Approximately 1.4 billion Muslims have produced almost nothing yet 14 million Jews have given so much to humanity. We simply cannot repay what we owe to Jonas Salk who invented the polio vaccine in 1955, preventing billions of Muslims, Christians, Hindus and Jews from the effects of the deadly virus. The Nobel Foundation is awarding the prize for more than 100 years, yet during this period the 1.4 billion Muslims have produced only six individuals who won the prestigious award: Abdus Salam considered a persona non grata in his own country, because of his religious beliefs; Ahmad Zawail with an American citizenship pursued his work in the U.S.; Naguib Mehfooz, an Egyptian was stabbed in the back by a fanatic Muslim; Shirin Ebadi, an Iranian human rights activist is in exile in Canada due to threats to her life in her own country; Orhan Pamuk, a Turkish novelist was criminally charged after he made statements alleging mass killings of Armenians and Kurds during the Ottoman period; and Muhammad Yunas, an economist from Bangladesh and the founder of Grameen Bank who has also been subjected to an audit by the government for alleged wrongdoings. A number of petty cases have also been instituted against him. At present only one percent scientists in the world are Muslims. Today a large part of the Muslim world is taken over by forces preaching nothing but hatred and contempt for all others belonging to the out-group. Anyone can be held guilty of blasphemy if his or her views do not match with the official dogmas. The total emphasis is on the revealed truth and not on empirical knowledge. We hate to find the truth. For us truth lies in all kinds of conspiracy theories. From 9/11 to the crash of Air Blue Airliner to cricket match fixing to floods every phenomenon was the result of some kind of conspiracy against us. In a recent survey conducted by “Newsline”, 57 percent of Pakistani youth was in favor of a non-secular state. You visit any educational institution and would find more than half the students with obscurantist views. This ideologically motivated lot is conditioned to see the world in a context which suits their strongly held beliefs reinforced by the forces of dark. No place for empirical knowledge on the national priority list, indoctrination of hatred, intolerance, revenge, death and destruction is what leads to the collapse of civil order, civil society and finally the state. Quest for empirical knowledge, tolerance, respect for mutual coexistence, love for all human beings regardless of their faith, are attributes of a progressive, peaceful and prosperous society and a stable state. I have seen this argument before and have to this point provided caution in relation to several assumptions and variables. For one thing, not all Israelis (or Jews) are successful or otherwise shielded from the vicissitudes of life. About 20 percent of Israelis live in poverty; a significant number of Israelis emigrate for both economic and educational opportunity plus personal reasons, a mixed picture but one suggesting too that all is not magical in the Jewish State. The “family values” mentioned, including their being deeply integrated into a now ancient and global ethnic and religious commune, has its own intellectual roots and evolution that starts with the Torah and its mix of origin myths, legends, illustrative stories, and admonitory rules that INVITE argument, criticism, discussion, and exegesis. Despite the investment or expenditure of great energy in determining a good way to live (with God and with others), the Jewish experience includes horrific episodes of destruction and suffering. Such historic tragedies tend to cleave away what one may call “things that didn’t work” — like priests and animal sacrifice and burnt offerings. Thirteen million contemporary Jews, fewer than half gathered in modern Israel, the rest scattered in Diaspora and sharing a common heritage in each heart comes to not even 1/100 of the Ummah’s breadth and reach involving the conquest / conversion / reversion of thousands of otherwise formerly separated peoples. A certain kind of social engineering story comes out in the numbers cited in relation to state-based investments split between, say, defense ware and human capital. However, another part engages with self-concept and the detection and definition of ideals and values as they may be envisioned and suspended in language and transmitted in language behavior. The Jewish heritage has not only to do with “investments in human capital” but with the transmission across generations of the core monotheism, i.e., faith in one God, a concomitant investment in the guidance inspired by the study of the Torah, and, finally, the integration of that conversation into Jewish customs, laws, and traditions that have radiated outward into larger global societies, making, for example, the Romans who once destroyed Jewish life in Jerusalem, Christians, millions of whom promote the Jewish return to Jerusalem and the Land of Israel. As seen in the last century, neither customs nor ethics served to defend mine from German barbarism, but both having informed a greater surrounding civilization — having more of humanity with it, literally — prevailed in that round. It doesn’t take much light reading in, say, linguistics to realize how wild a species we are — just as we are biological and have to wrestle with all implied by that — and I’ve inclined to think that civilizational efforts are essentially minority affairs, i.e., with many contributing “moral entrepreneurs” everywhere (from many walks) working with language across time and through the species but slowly and with time to be slow to effect adaptive, global, and positive change, but not monolithic change. In essence, I believe an evolving, modernizing humanity will strive to improve its felt qualities of living, but it may do so while experiencing and grinding against other tendencies. At about this point, I generally note that Moses led not only Jews but a “mixed multitude” out of Egypt, and as parable the story repeats itself but perhaps in widening circles. It’s coaches a competition where one must win (something, I guess) at the expense of the other. However, the structure I foresee is more integrating, more binding together, more engaged with an evolving way in thought that need not belong particularly to anyone but may be more a natural expression of an evolving human consciousness. Again, within that cosmological view, God and a small part of the world work on that emergence together and across myriad cultures and languages, while the larger part of the world passing its ages in darkness becomes with every generation itself a little smaller. “For the record, Jewish thought, as little as I may know of it, may reject or overarch the Christian invention of “Original Sin”. The emphasis I have found in cursory online reading more involves the human awakening to life and, indeed, its travail. While the story contains an admonition (“Don’t eat the apple”), a crime (the snake tempted Eve who eats the apple and has Adam share her fate — rather like marriage, that), and a punishment, the whole involving the “fruit of the tree of knowledge of good and evil” may signal the removal of the human from a less conscious natural order to one, as I’ve suggested, suddenly conscious, self-aware (self-conscious), and conscionable, i.e., aware of right and wrong. “Speaking as a Jew: the traditions in English literature twine with the history of Christianity and the presence of the Enlightenment, and there has been in that a tension maintained between clerical and natural views of man’s existence and cultural and social ways. I think we are old enough — I hope I am — to understand even from a one-language perspective (my limitation, unfortunately) that other languages contain and sustain other histories, ideas, and potentials. It’s not courage and strength that lend themselves to fascism, any format, but fear and weakness that allows such juggernauts to overtake men and women unprepared for it or vulnerable to its pandering and its promises. Time and again, as much happens — and it can happen anywhere — and to head it off, because the fascistic impulse is always unnatural, unsustainable, and tragic, one asks for a more informed and strengthened common humanity — that is work for language but not just one language.